In an age of increasingly fragmented or declining media audiences, commercial radio continues to deliver high reach for advertisers: around two-thirds of adults tune in every week. Music is inherently emotional, and radio stations often talk on-air about topics in a way that triggers an emotional response; research highlights the positive emotional influence that radio exerts over listeners – people feel twice as happy when listening to radio – making them more receptive to advertising. 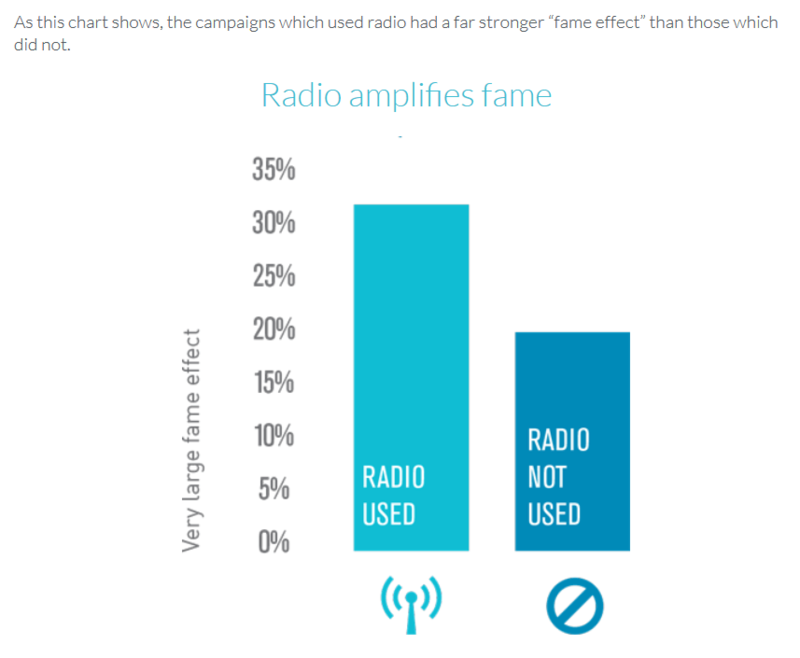 Radio amplifies brand fame: analysis of the IPA Databank reveals that including radio as part of the mix significantly increases the chance of achieving brand fame, as the chart below shows. In Re-evaluating Media, Ebiquity identified 12 attributes of media that are considered when planning brand-building campaigns and analysed 75 different industry studies to develop an evidence-based perspective on how strongly each medium performs against these individual attributes. The relative strengths of the media in the study can also be compared at a holistic level using our Media Attribute Mapping Tool. Ebiquity’s analysis demonstrates that radio is the second strongest medium for building brands after TV. In summary, different analyses suggest the same thing: radio has all of the characteristics required to play an effective brand-building role. This is also reinforced in terms of measured campaign outcomes. Ongoing effectiveness research underpins how radio can have a significant uplift effect on awareness, brand relevance, trust, and consideration across a wide range of sectors and media mixes. Separate research demonstrates how radio increases brand salience using Byron Sharp’s mental availability framework.